While in Haiti in 2003, the crew of Sub Sea Research was approached by locals who had found interesting items while out diving or fishing. These items were often duds, but every now and then someone found something of value. On one occasion, a man showed up on the ship and told interpreters that he had found a very valuable artifact. He said he couldn’t talk about it there, and asked the crew to meet him at a rendezvous point. My dad Greg Brooks headed out with a couple of others on a small rented Haitian boat to a secret spot out in the ocean. The man was there on a ship with several others, near a small dugout that was covered with a piece of canvas. As soon as the SSR crew arrived, the man revealed the object to be pieces of a once beautiful bronze cannon with dolphin handles. The cannon was likely from the 1700s and would have been very valuable, except that they had used a hacksaw to cut it into pieces to help lift it out of the water while scuba diving. He asked my dad for $20,000 for this cannon. No deal was made, and the SSR crew members headed back to the Diamond. The next night one of the men who had been working on the cannon site showed up at the Diamond. He offered to take SSR out to the site where the cannon came from, assuming he could be paid. This seemed like a good idea, because while the cannon was unusable and pretty much destroyed, it had initially been a valuable item. Their thought process was that there could be more items of value nearby. They paid this man and he brought them out to the site, which was very unusual. It was located up against a rock ledge that came into the water at the mouth of a bay. The way it was set up allowed a ship to hide inside the inlet and come out on the other side. It was the perfect hideaway, and was likely used by pirate ships back in the day to sneak up on unsuspecting vessels. SSR did a magnetometer scan of the area and detected ferrous metals. There were probably more cannons against the edge of the cliff, but there was so much sand and debris that it was impossible to uncover it with the technology they had. This was an instance where having a smaller ship would have made things easier. The debris was so close to the ledge that it would have put the ship in harm’s way to try to use sand blowers over it. From the topography of this region, my dad thought there may have been a fort on the ledge at one time that had collapsed into the sea. This would account for all of the debris and sand pile-up. In order to uncover this area, they would need a smaller ship equipped with water jets, which they didn’t have at that point in time. To this day, my dad still wants to go back to this site. He said that the cannon they had seen looked to have come from a royal ship or pirate ship. Those types of vessels often carried a lot of cargo, which was usually part of why they sank in the first place. This wreck site was unique looking and very charming, with its hideaway inlet and rock cliff. Despite its challenges, my dad dreams of going back and uncovering some of the debris to find just what those ferrous metals underneath are. 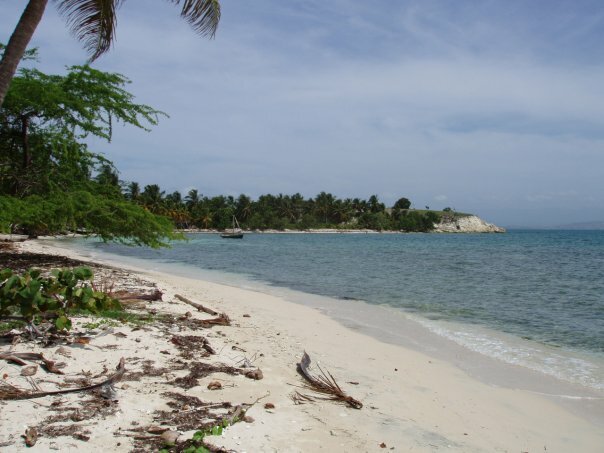 Haiti has always been a favorite location of treasure hunters, since it is located in the central Caribbean and served as a port to many ships – merchant and pirate – as early back as the 1500s. Sub Sea Research has found a variety of sunken ships off the coast of Haiti. Later this week I will tell the story of how they located one of the most famous ships of all time, the Oxford, belonging to the famous pirate Captain Morgan.